Sandhill cranes, with the help of their sentinels, scope out a roosting spot on the North Platte River near Kearney Nebraska at twilight. Spring like all the seasons has special meaning to all of us. It’s a time of intent. New beginnings, rebirths and regeneration. The initiation of a new cycle. And it too, has it’s smells and sounds. One event in particular defines spring for me. Like they have for centuries, the majestic Sandhill and Whooping cranes, with out-stretched wings, recently made their migration from Mexico through America’s heartland on their way to more remote regions north. Unfortunately, due to work conflicts, I wasn’t able to witness the spectacle this year. My wife and I have had the privilege of visiting good friends Jerry Kenny and Bridget Barron ; Executive Director and COO, respectively, for Headwaters Corporation in Kearney Nebraska to see first hand shrouded skies and corn stubbled fields amassed with these beautiful creatures. Headwaters has been overseeing the Reclamation of the North Platte River Project for nearly seven years. It is a program dedicated to reclaiming, revitalizing and sustaining the river and river habitat for a myriad of migratory birds and wildlife. It is a life belt of water in central Nebraska. Kenny, Barron and their entire staff reap the benefits each spring and summer as they witness activity in the flyway and nesting grounds. Though we weren’t able to make the pilgrimage, we did, however, see Dean Reynold’s CBS’s segment on April 1 featuring the crane migration with wonderful appearances by University of Nebraska emeritus professor Paul Johnsgard and Jane Goodall as well as Joel Sartore’s piece on the March 30 Sunday Morning program. I emailed Jerry and reported just hearing on the news programs that incredible ancient call the birds reveal on their migratory stop in the heartland of America made ” my juices really flow”. He responded with a classic Jerry Kenny response. “There has been excellent viewing this year, but they will do it again next year. 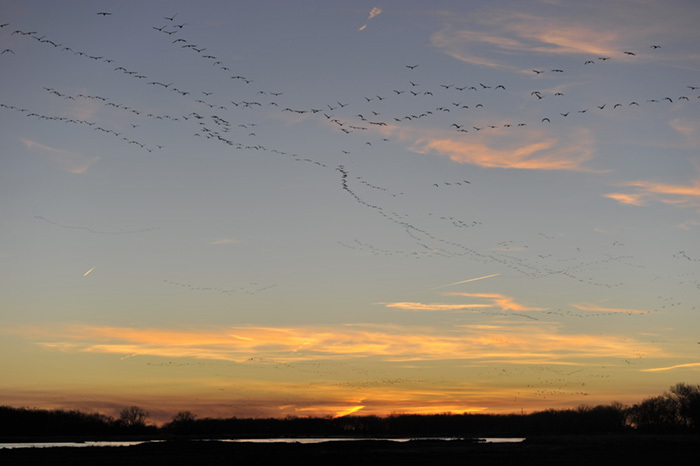 And, Nebraska is open all year, so you don’t have to wait for cranes to come on out and enjoy the Good Life!”. 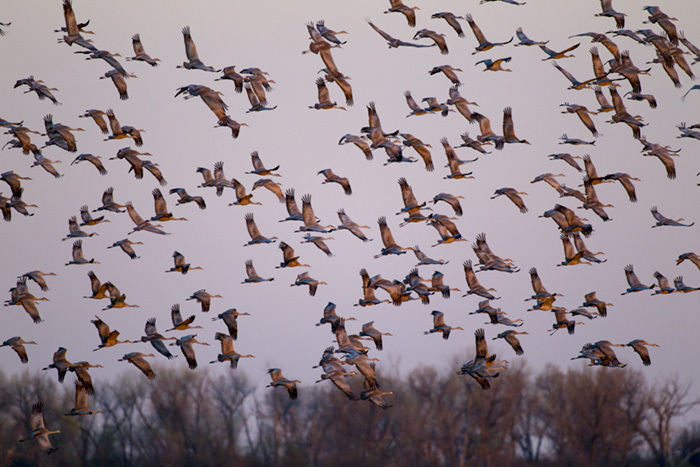 Lacing the sky at sunset like well strewn ribbons, the Sandhill cranes move with precision westward along the North Platte River near Kearney, Nebraska during migration.